When hunting, the primary concern is accuracy and precision. Of course, the accuracy and precision of your shot is heavily dependent on the type of sight you use. While most firearms come with iron sights, this may not always be sufficient. If you have poor eyesight, lining up the small iron sights may be too difficult, if not impossible, and will cost you a shot from time alone, if not from accuracy. Red dot sights make that a problem of the past. These sights allow a reticle to actually be projected to your eye. When mounted and adjusted properly, they provide a quality targeting system that is generally sufficient, if not superior, for most users. 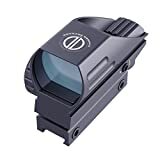 Moreover, red dot sight provide the advantage that they will often allow for longer shots with better accuracy over iron sights and are far easier to use and more comfortable than scopes. Still, there is a large market of potential red dot sights whose products have a great degree of variation in quality and performance. That is we have assembled the top-3 red dot sights on the market and even picked a budget option if you do not shoot often enough to command the investment for one of the best. Our Gold Pick Winner goes to a brand that has a long a trusted reputation in the optics industry. Notice, we said optics and not red dot sights. That is because Bushnell has been making a wide variety of optical devices for decades. Beyond red dot sights, Bushnell also offers traditional scopes as well as binoculars. First, this is not truly a professional red dot sight. While skilled professionals can more than make use of this sight and get an excellent price to value ratio out of it, this sight simply does not have all of the bells and whistles nor the most cutting edge technology. This is not to say that the Bushnell is a poor product. However, if you are interested, there are red dot sights on the market that cost 3 times as much or more and will provide a superior product. Still, the Bushnell does everything exceptionally well and will provide a high quality performance for all of the general functions of a red dot sight while still adding a few nice touches and technologies to match. First, this sight is incredibly accurate. Whereas some other sights will constantly require you to re-zero and make adjustments for every new shot, the Bushnell provides an easy set it and forget it experience. This is important, because when you are out in the field, you do not always have time to be fiddling with the brightness settings. Moreover, making adjustments based on range and wind can require some serious math to be worked out in your head. However, when you see a 10 point buck walk out across the field from the forest line, your adrenaline will naturally start to rush. In this instance, you do not want to have to take the time to do some quick math in your head, readjust the sight’s settings, and then line up the shot. Of course, this does not mean that a single setting is suitable for all shots. Every sight except for the most advanced which have internal targeting systems which take into account the distance of the shot and automatically adjust to better suit the distance will require you to make some adjustments. Still, there are a few things to keep in mind with this red dot sight and the other entries on this list. First, the brightness settings are not always to everyone’s liking. Specifically, there may be too much difference between each brightness setting so that you never actually get the perfect setting you are looking for. However, this is very much dependent on the user’s biological limitations and personal preferences. Still, even those who noted they would have preferred a bit more refined brightness settings said that it was not much of an issue and were still able to find an acceptable setting that performed well and allowed them to take accurate and precise shots. Moreover, those same people who would have preferred a more robust brightness variance were shooting in low-light conditions. However, this is still a powered red dot sight and will provide a boost for those low-light conditions. The Bushnell will not actually be too dark. In fact, it was noted more often that the Bushnell got just a touch too bright. This made the reticle become a bit fuzzy but did not wash the sight out. As the day progressed, however, the natural light combined with the decreased brightness setting of the sight seemed to level everything out. In this regard, the Bushnell is probably better suited for situations in which there is plenty of natural light. Dawn and dusk shooting will present the most issue, but as mentioned before, it is nothing that will actually prevent you from making an accurate shot. You just may have a different preference that sight cannot always accommodate. The viewing lens itself is amber colored which also aids when shooting in low-light conditions by washing some of the wavelengths of light which have a tendency to distort optics out of the sight. The Bushnell features a 3 MOA red dot which is a bit on the medium to large side. This can give the impression that the dot is obscuring the target at far distances. However, for most distances, this will not pose a problem. Still, the optics are very clear, and you will have no need to squint or close one eye. The ability to keep both eyes open allows you to take a more accurate shot and is the proper shooting technique. Moreover, there is a fair amount of positioning range for the user under which the Bushnell will not suffer from parallax error. By this, we mean you can actually look around the scope and target while the reticle remained in position. Of course, this is not a perfect effect, and the best shooting technique is still recommended to ensure accuracy and precision are maintained to the highest standards. The Bushnell also feels very solid and is incredibly durable. The sight is waterproof, fogproof, and shockproof. The means that even the clumsiest of shooters should be able to keep this sight in one piece. Its cover is made from a thick rubber that allows quick and smooth removal or application. The setting knobs provide a bit of resistance which is nice in that gloved hands are able to adjust them without having to worry about sensitivity. The Bushnell uses a cross-screw rail mounting system, but it is a bit on the smaller side. While this has no effect on the quality of the image, you may need a riser for certain firearms depending on the iron sights. Our Silver Pick Runner-Up winner actually goes to a company that specializes in manufacturing firearms. This is an important distinction to make. This means that the Rhine red dot sight will do some things fairly well while other qualities may not be spectacular in any meaningful way. That is exactly the case with this sight. First, it should also be noted that the firearms Rhino specializes in are handguns, not rifles or shotguns. Again, this does not mean that the Rhino will provide a poor experience, simply this sight is made by a company that is venturing out of their expertise, and that should be kept in mind. However, as a specialist of firearms, the Rhino will provide a stable mount that will fit a variety of firearms without too much trouble. Of course, as a firearms specialist and not an optics specialist, like Bushnell, you should also understand that the sighting will not be as spectacular. In this way, the difference between our Gold Pick Winner and all the other entries on this list is a vast chasm. However, that difference is also reflected in cost. The Rhino is almost two thirds cheaper than the Bushnell and the price to value ratio is exceptional in these terms. Still, if you are looking for a substitute to a professional quality red dot sight, the Rhino may not satisfy your needs. Whereas the Bushnell can be seen as an adequate budget option for a professional red dot sight, the Rhino, and consequently the other entries on this list, are better understood as simply budget options all around. Still, one thing that the Rhino gets right is frame design. This is not a perfect feature, but the Rhino is certainly able to be more versatilely mounted on different set ups. Of course, this does come at a cost in that you may need other accessories to mount this on different firearms. However, the red dot sight is easily mounted. The bad news is that this does not come with a picatinny rail mount. This seems like an obvious flaw to overlook one of the more popular mounting apparatuses used, but as you will see, there is a reason. Whereas the Rhino does not come with a picatinny mount, it does come with a cantilever mount. The advantage of the cantilever mount is that it can be used in conjunction with a scope. Whereas the Bushnell kind of forces you to choose between the red dot sight or a scope without some clever adjustments and perfect positioning, the Rhino allows you to use both simultaneously. This can provide a tremendous shooting advantage in that you will be able to switch from one to the other as the situation calls. If you are shooting numerous targets in quick succession, you will most likely want to use a red dot sight. However, if you plan on taking incredibly far shots, the scope is really the only game in town. Unless you plan on spending considerably more money—potentially 10 times or more—you are unlikely to be able to get a red dot sight that can also function as an adequate scope. While the Bushnell will provide some of this capability in a single product, the scope function is simply not on par with professional quality scopes. Of course, this can create other problems. Firearms are already heavy tools. Once you add a scope that puts even more weight on the firearm. Placing a red dot sight as well as a scope on a firearm may simply be too much weight for some people to effectively handle. In this case, the ability to mount both is futile. Moreover, the Rhine red dot sight can be mounted in a way that does not impede the scope, but it will still look awkward. On top of that, you will definitely have to be more careful with your rifle as the height clearance will be increased by a few inches. The Rhino’s optics are nothing to brag about either. This sight offers five different brightness settings which may not suit every shooter’s needs, let alone their preferences. The Rhino does come with eight different reticles, four patterns in each green and red. The reticle’s MOA also comes in three different dot sizes. Moreover, the Rhino was designed to handle tough conditions including fog and shocks. It offers a 1-year, no questions asked warranty which is nice but must make you wonder a bit. Regardless, if you are not looking for a high-end red dot sight and would like to use it in conjunction with a scope, this is the choice for you. At a similar price point, the Dagger Defense is only the Bronze Pick Third Place winner on this list because the Bushnell is a superior reed dot sight and the Rhino is somewhat unique in its design and versatility. However, make no mistake, if you do not intend to mount your red dot sight in conjunction with a scope, the Dagger is as good of a, if not better, pick than the Rhino. The Dagger is also the first entry on our list that aims to serve as a holographic EOTech substitute. Of course, there is only so much a traditional reflex red dot sight can do to truly substitute the holographic qualities of an EOTech, but the Dagger does the best that it can and performs admirably all things considered. Still, it should be noted that you will not ever confuse the Dagger with a true EOTech holographic red dot sight. The point of the marketing gimmick is to let the consumer know that parallax error caused by looking around the dot or improper shooting position will be minimized when compared to many other cheaper red dot sights. However, this effect is still not as effective as with the Bushnell. 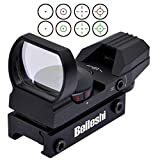 Of course, the Bushnell achieves its red dot consistency through its optical design which receives light at an angle so that the projected reticle will look similarly and follow the user’s eyes or position. In terms of construction, the Dagger really shines. This red dot sight is made out of aircraft-grade, high-quality aluminum. This provides a couple advantages. First, this makes the Dagger a fairly light reflex sight. Whereas the firearm itself is generally already somewhat heavy, adding extra weight on top of that can make it further unsteady. With an aluminum construction, the Dagger adds far less weight than some of its competitors. However, the aluminum constructions adds other benefits as well. The Dagger is incredibly durable and will not suffer from risk of fog or rusting. Also, the aluminum construction makes it an incredibly stable red dot sight. After your initial zeroing in process, the sight will maintain its position for many shots—customers have reported not needing to rezero the sight after more than one hundred shots. This is not the only area where the design stands out. The Dagger is also fairly compact. This means that it has a low height clearance which makes handling the firearm with it attached easier. Also, the whole frame is held in place with high-quality Allen head screw, which further prevent the need to rezero or reposition the sight. One issue is that the height setting of the sight is also set with an Allen wrench which can be tedious and frustrating if you are shooting at various elevations on the flay. Still, this is a great price for value purchase and an excellent choice for those looking to do some close-quarters shooting. Our Best Budget Pick goes to a Beileshi. Beileshi is another company that specializes in optics and provides a wide range of products beyond shooting optical devices. However, this company is definitely on the budget end as most, if not all, of their products are designed to provide a solid, though not special, experience for the use. To be honest, while there is nothing truly wrong with the Beileshi, its price is not significantly less than the Silver Pick Runner-Up Rhino nor the Bronze Pick Third Place Dagger. In this regard, the price to value ratio is a bit skewed, and it might be in your best interest to pay the extra $10 to $20 and just get one of those. However, if you are truly strapped for cash or simply do not shoot often enough for it to matter, the Beileshi will still provide an adequate shooting experience. Though, you will likely need to have excellent form and already be fairly skilled. This sight will not account for a sub-par shooter like some of the others can. In that regard, those who are skilled enough to get the most out of this sight will likely become frustrated with some of its limitations. That is another reason we advise purchasing at the least, the Bronze Pick Dagger. Regardless, the Beileshi is essentially the same red dot sight as the Field Sport. Both sights use the same design and the same reticles. In fact, that is one of the potentially nice bonuses with the Beileshi. It provides eight different reticles. You get four reticles in green and four in red. The reticles patterns come in dot, encircled dot, crosshair dot, and encircled crosshair dot. This provides you different options to suit your preference and can even come in handy depending on what you are shooting. Still, the reticles themselves will not really adjust with different user positioning, so do not expect parallax error to be corrected. The Beileshi uses a picatinny base which does make it fairly easy to mount on a variety of firearms and the mounting frame is held in place with Allen head screws. Unfortunately, this also applies to the elevation settings. This means that if you want to shoot at different elevations in the field you will need to bring an Allen wrench with you and adjust the elevation setting manually every time. If you are stationary shooting on the ground, this should be too much of a problem. However, if you are tracking or in a stand, this will cost you valuable time and be fairly annoying. Of course, that likely will not be much of an issue, because this sight provides no magnification potential. Different red dot sights will have different types of reticles. In fact, there are a wide variety of reticle types—more than 10. The type of reticle can generally be defined by two characteristics: dot size and dot pattern. The Dot size is fairly self-explanatory, but it can have a big impact on your shot. For instance, if the dot is too small, your eye may not be able to see or track it properly, and you will miss your shot. Conversely, if the dot is too large, your target may be obscured—especially when shooting from far distances—and even if you hit your target, your accuracy and precision may suffer. The pattern of a reticle generally refers to crosshairs or rings around the dot. These can help line up the shot or they can provide a quick gauge for distance if you know how to use them properly. However, if the red dot sight comes with changeable reticles you should be wary. This is usually a tacit admission by the manufacturer that the reticles themselves are poorly made and unreliable. Not all firearms have the same amount of clearance for an additional mounted sight. While the practical concerns are fairly obvious, generally you can find somewhere on the firearm to mount the red dot sight. However, where the sight is mounted can also play an important factor in the accuracy and precision of your shots. If your sight is mounted at an improper distance—which can be the difference of inches—you will not be able to best see through the sight and judge the shot. 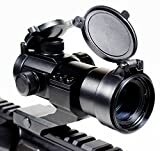 This can create different problems from not being able to see through the sight at all to the sight distorting the image to the sight not giving an accurate gauge for targeting. When choosing the sight, make sure your firearm can properly mount it at the appropriate distance. Depending on your eyesight, this distance may be further or closer than another’s. Your shot is often entirely dependent on the quality and reliability of the sight you use. Of course, your sight can only be as precise as it is stable. All red dot sights come with a frame that can be mounted onto your firearm, but the actual securing pieces will vary somewhat from model to model. If the mounting frame is of a poor quality, the sight may not be stable. This issue can arise both where the sight mounts to the firearm directly or within the frame after it has already been mounted. The former will be more obvious to detect as the mount will move a little bit when jostled or disturbed. The latter issue can be difficult to detect, because this means the actual frame itself is not securely built. In either case, it is advised that you simply purchase a better quality sight since the necessary accuracy and precision of the shot will be directly correlated with the quality of the sight’s build. 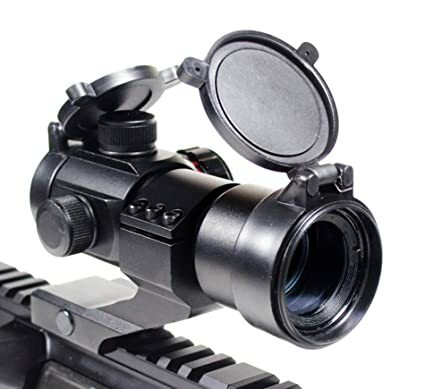 There are two primary types of red dot sight HUDs, or heads-up displays. These are reflex sights and EOTech sights. EOTech sights are a truly holographic type of sight, while the reflex sight is not. 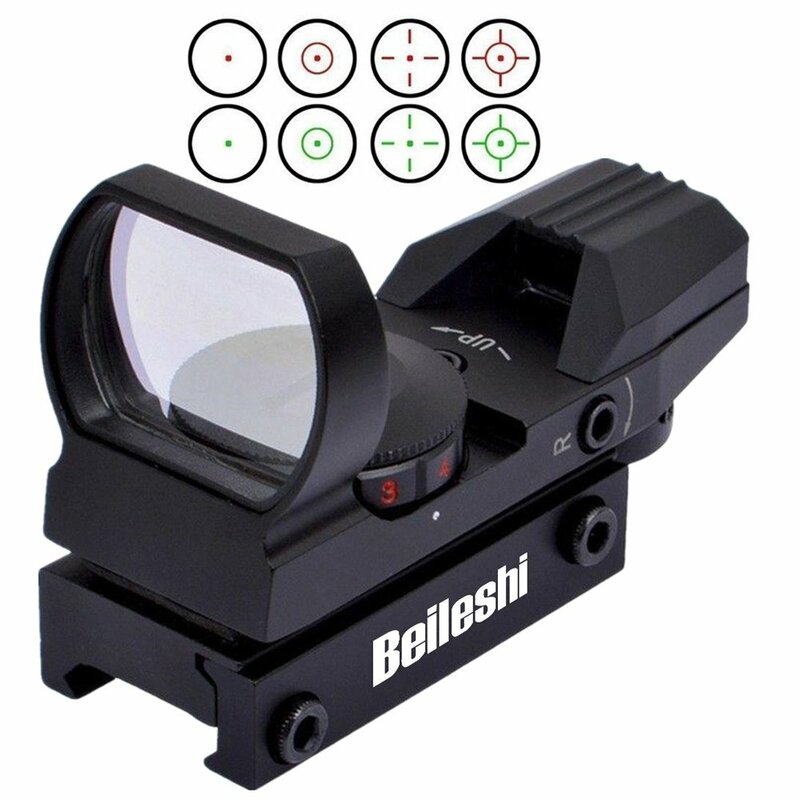 A reflex sight uses an objective lens to reflect the reticle’s wavelength back towards the user. Essentially, this creates an image that is stationary, though the user’s positioning and movement will affect the projection of the reticle. In this case, the user will need to use proper form or suffer from an increased parallax error. Holographic reticles are actually illuminated by the sight itself, so the user’s position will have less effect on the performance—however, it should be noted that poor shooting form will always create parallax error, regardless the sight. Some sights, even reflex sights, make attempts to counteract user error, but no sight can account for all possible poor shooting forms. Using a red dot sight takes practice and skill. While it is intended to assist in increasing the accuracy and precision of your shots, it will inherently require you understand the effect distance has on the accuracy the sight provides. Red dot sights are not magic. They will not ensure that you hit your target. This is especially true if your weapon has a limited range. If you weapon is accurate within a given number of hundreds of yards, a red dot sight will not make the weapon any more accurate beyond that range. If you are a skilled shooter, you can actually use the sight to assist you in making the appropriate sight adjustments to improve the firearm’s range, but even then, those results are likely to be inconsistent. In this case, it is best to understand the maximum range of the weapon and purchase a red dot sight that is best suited for that range. While red dot sights are very adaptable in this context, some of the better sights will prove far more effective at longer ranges than the cheaper options. Most red dot sights are powered and require batteries to be used. However, there are non-electronic red dot sights. These use special materials to generate a lighted image, as opposed to an etched image—which no red dot sights use, but some scope do. The advantage of a non-powered sight is obviously the lack of need for batteries. However, non-powered red dot sights have more limitations than the minor cost of batteries and do not provide as good of a price to value ratio. In certain lighting conditions, the reticle of the sight may be washed out completely. Moreover, no powered sights are usually effective in low-light or better but not in darkness, whereas some of the better powered sights may even include a night vision setting. Powered sights have advanced a good deal in terms of power efficiency, and many of the better models of red dot sights will provide years of use with a single set of batteries. Unless you plan to plunk down some serious cash, you best bet for a close-quarters red dot sight is a reflex sight. All four of the entries on this list are reflex sights, though one stands out above the rest. 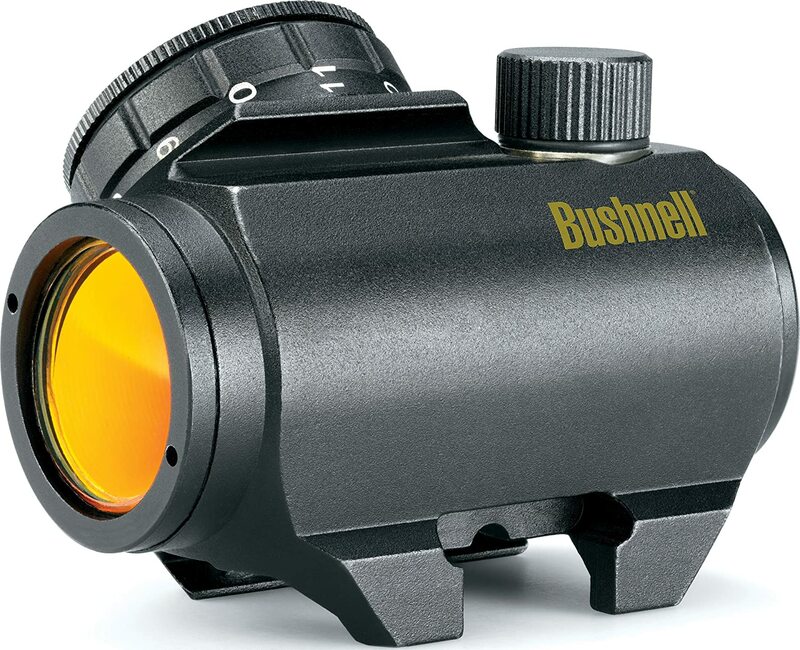 The Bushnell utilizes a unique optics design to provide a consistent and secure projection that minimizes parallax error and allows a wider range of skill sets to use effectively. Of course, it also comes with a hefty price tag when compared to the other options. The Rhino is an excellent choice if you plane on using a scope in conjunction with your red dot sight, and the Dagger is an all-around solid product that may be the most durable. The Beileshi is probably best avoided since it is not much cheaper than the Silver or Bronze Picks, but it will do in a pinch and is acceptable if you are not an avid shooter. Regardless, depending on your skill and regularity of use, there is a red dot reflex sight on this list that suits you.